Housemarque’s (Resogun, Dead Nation) latest effort ‘Alienation’ pits you and 3 others (friends hopefully) against relentless waves of of invading aliens in a fast-paced top-down shooter. Not an original formula to be sure, but what it lacks in originality it makes up for (in spades) with its deep marrying of many simple engagement systems. In fact most of what the game offers is not revolutionary in any way… yet I keep coming back for more. As I’ve discussed previously, ‘extrinsic rewards’ are very important to the long-term health of your title. This game focuses almost exclusively on these type of rewards – to it’s benefit. Each minute devoted to your character yields forward progress. Levels feel open, yet focused and easily traversable. Light strategic elements pepper both the skill and weapon upgrade systems. This isn’t to say that it isn’t visually dazzling game – alien blood, dense sparks and beautiful ragdoll ARPG death are all around you, but the visuals pale in comparison to the hooks that the game will get deep into you if you have even a passing interest in top-down shooters, loot based games, or anything coop. A 360-degree approach has obviously been used in the level construction. The missions take place in large, relatively open maps. Different missions cross the same physical spaces, but never make you tread the exact same ground. This economy of environment art I’m sure paid dividends on this small title, allowing much more time for polish, but it also helps the player to deeply grok the environmental space. I was thankful for this as it becomes very important to know your exit strategies when facing the hordes of enemies the game throws at you. To make people feel that moving through the same environments in a video game is good thing? This is simply a great accomplishment. Explosive objects are liberally sprinkled throughout the levels, creating opportunities for fiery excitement and fist pumping wins. With the short timer and large range of each explosion, it requires some thought before simply leaning on the trigger and swinging your analog stick around. Another thoughtful move. The game even provides the opportunity for you to destroy respawn points for a loot multiplier. This simple risk vs reward scenario is the perfect analogy for how elegantly the design has been constructed. 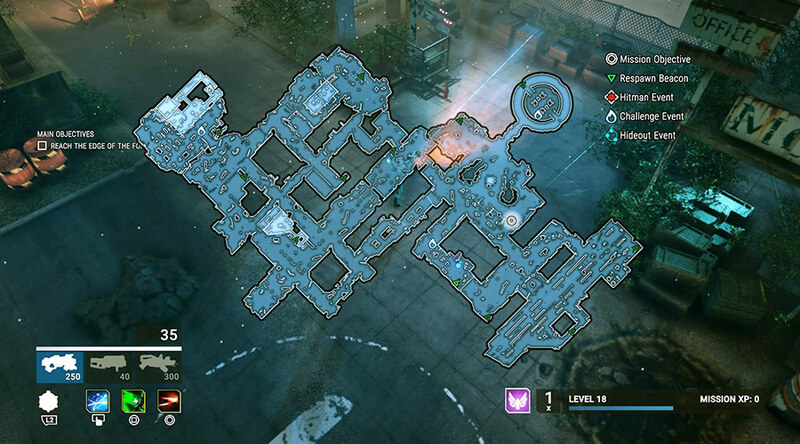 The game’s use of enemy spawn positions, attacks and behaviour is also astute. Although positions can often be anticipated, it does a great job of always throwing a few enemies behind you, forcing you to think on your feet. This enhances the twin-stick mechanics and avoids the dreaded ‘i’m always just backing up’ situation that can plague these titles. Each few minutes you are alerted that a ‘horde is approaching’. After a few seconds you are basically swarmed by existing enemy variants that have low health but rush towards you with abandon. This is in addition to the ‘normal’ enemies that are always near. Introducing a difficulty increase on an unseen (but consistent) timer creates a sense of tension in the player and opens up different strategies: the horde’s low health and vast numbers gives you opportunities to stock up on item drops such as ammo and health pick ups. When starting a mission you are asked to select one of 3 difficulties. Each option gives you a detailed breakdown of what each offers. Important information is highlighted – such as what % of higher quality items will drop at each difficulty. This clear presentation and focus on the main reason for its replay value – those shiny new items, makes the player feel in control and gently nudges them into attempting higher difficulty levels in search of these coveted treasures. While nowhere near as complex as the itemization as say Diablo, or even Torchlight, it serves player needs well. Each of the 3 classes has one unique main weapon and can also equip a shared secondary, tertiary and explosive weapon. The main is essentially a straight ahead bread and butter type assault rifle; expected and solid. There is also a surprising amount of variety in the additional weapons to keep things interesting. ‘Powershots’ are low rate of fire cannons that deal vast damage in a straight line. You need to manage your aim, and keep an eye on your remaining rounds to be effective. But you can be. Oh, you can be. Proximity mines, remote detonated grenades and boomerang weapons keep things fresh and reward you for dexterous play. Shotguns even have enough variation in their rate of fire that they can feel like totally different weapons from one to another. 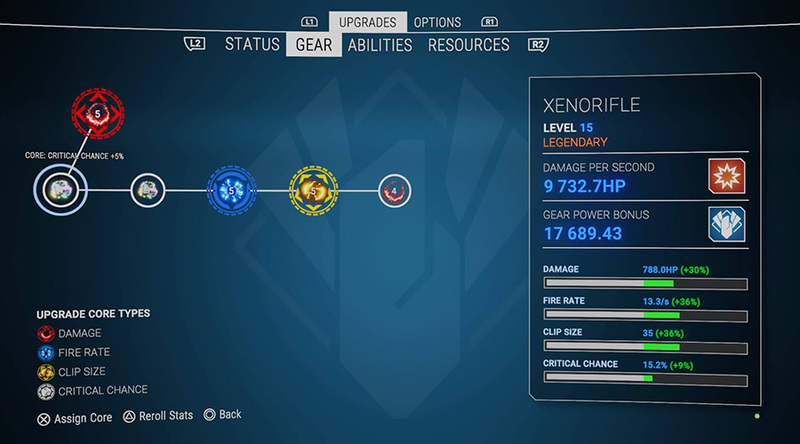 ‘Power cores’ dropped from enemies serve as weapon upgrading resources. They can be combined to increase effectiveness and provide additional bonuses if socketed into the correct core type (e.g. blue core in a blue socket). Pretty standard stuff, but the damage output you can ratchet up by socketing a few low-level cores into your favorite weapon is nothing next to impressive. This serves two important purposes: it feeds the ARPG gamer’s unquenchable thirst for MOAR DMG! @#!, but also gives incredible flexibility to your weapon selection. You are able to hold onto, and be effective with, your favourite flamethrower for much longer than you would expect. Since each mission difficulty is based on the player’s level, and items drop in consequence of this, you are always getting rewards that are useful and wanted. Item drop frequency is balanced just right to keep the flow of combat faced-paced without inventory checks every 3 seconds, but still yields exciting moments of surprise. The amount of ‘trash’ items is low and still serves to reward the player with materials used to ‘re-roll’ weapon stats. If all of this sounds as familiar as grandma’s favorite dessert, well, it is. That didn’t need changing, and neither does Alienation’s tried and true mechanics. There are many elements within that are shared with some of what I consider ARPG greats – Diablo, and Torchlight, Titan Quest, even Marvel Heroes 2015. What it does so uniquely well, is blend all of them so seamlessly, so effortlessly into a tidy, 20$ package that makes me still want to come back for more even with dozens of hours played. It’s tight engagement/item/progression loop rivals many AAA releases; all this with a razor thin story and other obvious cut-corners, such as the visually drab and simply functional UI. Critics are lauding its praises as well: when you compare it’s meta-score to recent high profile releases such as Battleborn (which probably had 10x the budget), it makes you pause and remember what you really have to nail to score with critics and fans. You don’t need to reinvent the wheel – you just need to make a reliable, sturdy offering that provides the player with lots of value and a continuing engagement loop… easy right?